I do goal-setting. The first time I read about this was in Napoleon Hill's 'Think and Grow Rich,' I was 16 years old. The top three for me would be Napoleon Hill "Outwitting the Devil", basically any Napoleon Hill books. "Think and Grow Rich", "How to Sell Your Way Through Life", "The Laws of Success." Really, really amazing books, especially when you're an entrepreneur. It's like I think a must to read. This book gives me the desire to really fight hard to achieve what I want to achieve in life. While I created a safety net for myself (by having a University Degree), I make calculated risks and go all out in my endeavors. This book dramatically changed the way I structured my day to day life. Based on over two decades of personal interviews and studies of some of history's’ greatest minds, the author distills the lessons he learned and details how you can train and condition your mind through daily habit to master your actions. The way it promotes a disciplined and holistic approach of continual self-improvement, goal setting and strategic decision making really resonated with me. “Think and Grow Rich” was recommended by a professor in a Computer Science class I had (random!). This book really convinced me that the human potential is limitless as long as we apply ourselves. I am in control of what I can achieve. If you apply yourself long enough and are willing to put in the hard work, you can literally think yourself to riches, and it's not only meant in the sense of money, but everything! A few months ago, I came to the realization that I was in a pretty bad financial situation. I had racked up a bunch of credit card debt and had not been saving any money for years. The main idea behind this book is to imagine your future self in the financial position you intend to be in. These are the three questions they ask: 1. How much money you will have. 2. When you will have it. 3. What you will do in return for this money. Then, you must write that statement down on a piece of paper, and read it once in the morning, and once at night – every day. I have it hung up on my wall right next to me as I’m typing this. I have tried a lot of things to save money over the years – none of them have worked too well. But these past few months have been some of the best for me financially. So far, this method has worked OK. I would strongly recommend these two classics. Think and grow rich! by Napoleon Hill. I was very much suffering from inferiority complex since young. I had low self-confidence and I was feeling bitter all the time. I was constantly asking myself, why was Ii not born rich? Why am I not perfectly handsome? Why am I not outspoken? Why don't I have many friends and that I was popular? After reading Think and Grow Rich I was enlightened. I then understood that my past don't represent my future and that others' opinion of me doesn't have to become my reality. I started taking full responsibility over my personal development and growth. Fast forward, I am utterly glad to have made the right decision. I know some of the most early books that were impactful for me were the obvious, like “Think and Grow Rich” from Napoleon Hill. The practical steps in this book for harnessing power are some of the best available. To grow rich, you must continually have positive emotions, rather than allow your mind to dwell on the negative ones. This is a key reason why I have a “no negativity allowed” policy in my office and home. Visualize and have belief in the attainment of your desires. Have faith, love, enthusiasm, and hope—avoid fear, jealousy, hatred, and greed. You have control over your thoughts, and your mind can produce anything. Think and grow rich—and become a multi-millionaire! 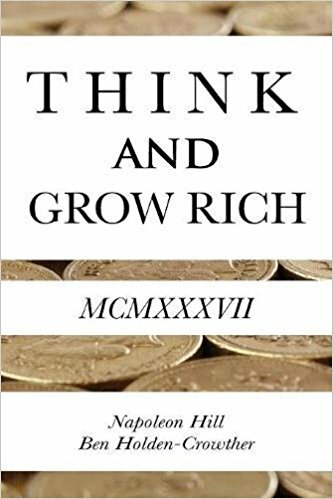 In a longer term classic Think and Grow Rich by Napoleon Hill had an impact on daily routines such as auto-suggestion and overall building a solid foundation for putting yourself in a position to be successful. Over 25 years ago, Napoleon Hill, then a young special investigator for a nationally known business magazine, was sent to interview Andrew Carnegie. During that interview Carnegie slyly dropped a hint of certain master power he used; a magic law of the human mind - a little known psychological principle - which was amazing in its power. Carnegie suggested to Hill that upon that principle he could build the philosophy of all personal success - whether it be measured in terms of Money, Power, Position, Prestige, Influence, or Accumulation of Wealth. That part of the interview never went into Hill's magazine. But it did launch the young author upon over 20 years of research. And today we open to YOU the discovery and methods of using the revolutionary force which Carnegie quietly hinted at. The thrilling methods of using it are now taught in eight textbooks known as the LAW OF SUCCESS. In the trail of the LAW OF SUCCESS lessons come accomplishments, not mere entertainment and time-killing diversion. There come larger businesses, bugger bank accounts, fatter pay envelopes; small enterprises given new life and power to grow; low-pay employees shown how to gain advancement by leaps and bounds. Think and Grow Rich is Napoleon Hill's newest book, based upon his famous LAW OF SUCCESS philosophy. His work and writings have been praised by great leaders in finance, education, politics, and government.